Want to Grow UUFE? Sorry. It won’t happen without Facebook. Our Adult Enrichment leader, Gayle Scroggs, does it. You can, too. 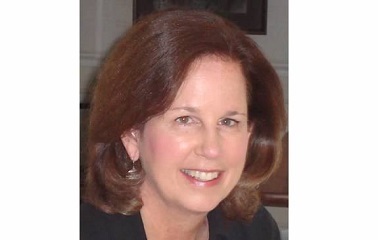 Blogging is easy – like writing an email. Most of us do email in a web form. Fill in the Subject and Text, check a Category box, and click Publish. Done, blogged! Then the magic happens. 87 people — family and friends of UUFE members who shared it – saw this post on Facebook within 24 hours. 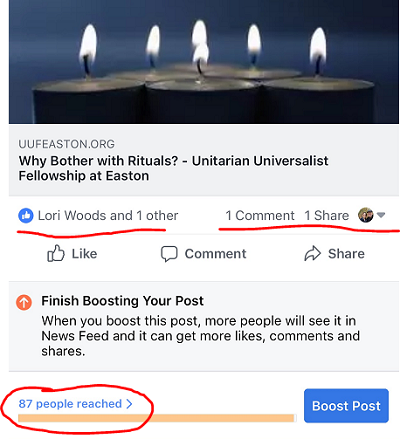 We can reach 870 or a thousand or more with each post, if UUFE members share our posts each time they appear. Need help to get started? Talk to Don B. during coffee hour. 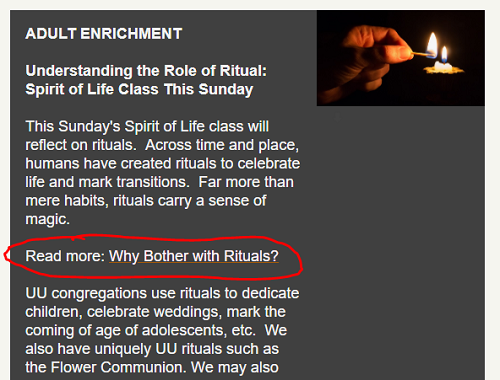 Or email newsletter@uufeaston.org. Thanks, Don, for your astute assessment. Blogging is easier than you think, and it is rewarding to think that each one of us can contribute to UUFE in this way. Stewardship is about total care, not just financial support.